Nine years ago I organized a panel for the Specialty Coffee Association of America called “Using Alternative Processing Methods to Create Product Differentiation: Perspectives and Opportunities.” Presented in Spanish and English, it attracted around five hundred coffee producers and roasters. The overall premise of the panel was simple: coffee is no longer a commodity beverage but a specialty beverage, and success in specialty beverages in part is driven by product differentiation: in other words by periodically offering something new and different to the market. I pointed out in my opening remarks that coffee producers have only three sets of tools to differentiate the sensory profile of their actual product, their green coffee: 1) terroir (where the coffee is planted), 2) tree variety (what kind of tree is planted), and 3) processing method (how the fruit residue is removed from the beans and how they are dried). Since a farmer may have trouble moving his farm to a new terroir, and since planting new tree varieties is a potentially tricky investment in creating difference that may take years to pay off, a logical first step in differentiating your green coffee from someone else’s is to experiment with processing, or deliberately introducing variations in the complex series of steps involved in drying and removing the soft fruit residue from the coffee seeds or beans. In 2005 this was a rather radical idea. Processing was largely seen, not as a creative tool, but as an annoying necessity that had to be gotten through as efficiently as possible with as little damage to the integrity of the bean as possible. Coffee people were wont to stroke their beards and sagely advise that processing can only damage the sensory properties of the bean, not help them. Well, as the fifty coffees we cupped for this article demonstrate, and as a younger generation of coffee producers, roasters and importers has discovered, variations in processing that are carefully and mindfully pursued can alter the sensory properties of coffee in amazing and exciting ways. Perhaps not make the coffee from a given tree better, but make it good in a different way. True, among the fifty or so coffees we cupped there were a few losers: coffees that probably would have fared better with the sort of clean, straightforward wet-processing that is still standard practice in Central America. But most of the rest of the samples were solid to amazing, and above all, seldom if ever boring. Of a total of fifty samples, thirteen scored 93 or higher, twelve of which are reviewed here. (Spyhouse Coffee Roasting sent two 93-rated coffees; we review only one of the two here). Seven more samples from other roasters landed at 91 through 92, and ten more at 90. Two basic alternative processing methods were applied to this month’s samples: natural, or drying inside the whole fruit, and honey, or drying with the skins removed but with some of the fruit pulp still adhering to the beans. Neither approach represents the orthodox processing method for Central America coffees, which is the wet or washed method, wherein all of the soft fruit residue, both skin and pulp, is removed from the beans before they are dried. The traditional wet processing protocol is to first remove the skins, next loosen the sticky fruit pulp through natural fermentation, and finally wash off the loosened, flabby fruit. Recently, particularly in Costa Rica and Colombia, the traditional ferment and wash step has been replaced by mechanical demucilaging: after skin removal machines squeeze the mucilage or fruit flesh from the beans with very little use of water. These mechanical demucilaging devices have two advantages over the old ferment-and-wash approach: used correctly they produce more consistent results than the ferment-and-wash method while requiring less attention, and they use much less water, making them superior from an environmental perspective. True, the ferment-and-wash method can be managed without releasing polluted water into the environment, but that management is a bit cumbersome and expensive. At any rate, the two main alternatives to either of these wet-processing approaches are the ancient dry or “natural” method, in which the beans are simply dried inside the entire fruit (the fruit residue is later removed by machine), or a method variously called honey or pulped natural, in which the skins are removed but the beans are dried with all or some of the fruit flesh or mucilage still sticking to them. The honey process can be managed in various ways. One way is just to skin the beans and dry them (now often called the “black honey” process in Central America), and the other is to use the demucilaging machines described earlier to remove some but not all of the fruit pulp, resulting in what is sometimes called “yellow honey” (most of the fruit pulp removed) or “red honey” (only some of the fruit pulp removed). The fifty alternatively-processed samples we cupped this month split about evenly between honey process and natural process. But for this month’s cupping, at least, the full natural or dried-in-the-fruit coffees carried the day with clearly higher overall ratings than the honey-processed samples. Of the thirteen samples we rated 93 or better, ten were processed by the full natural or dried-in-the-fruit method as opposed to only three processed by the honey method. And at the bottom end of the ratings there were considerably more honey coffees than naturals. None of the naturals we cupped scored lower than 88. I will not even attempt to hypothesize why the naturals prevailed so decisively. If I get some answers that make sense we will draw on them for a little blog on the subject later this year. I will say that there appears to have has been a giant jump in understanding and controlling the production of naturals, particularly in Panama and in Ethiopia. Top-end producers now appear to understand how to modulate the drying curve to maximize sweetness and fruit without inducing excessive fermentation of sugars. When the fad for natural-processed coffees from Ethiopia and Central America first developed, we tended to receive dried-in-the-fruit coffees in which the ferment was wild and exhilaratingly fruity in front but often astringent and almost rotten-tasting in the finish, particularly as the cup cooled and the excitement of aromatics dissipated, leaving the heavy impact of the ferment to weigh down the basic structure of the cup. The Ferment Note: Rye, Brandy, Rum or None? These days, however, one encounters naturals with virtually no sensory suggestion of ferment. The Dragonfly Panama Elida Estate Natural (94) and the Old Soul Panama Elida Natural Lot #5 (93) reviewed this month, for example, showed great sweetness and opulently complex fruit with virtually no hint of ferment. The Namusairo Panama NPGE Perci N2, a natural from Ninety Plus, one of the world leaders in high-end dried-in-the-fruit coffees, showed only a slight, subtle hint of cleanly expressed ferment (we associated it with rye whisky), so subtle that it seemed to convey no actual alcohol sensation as all, just a Platonic whiff of spirits. Most of the other naturals we review this month do show a more explicit fermenty hint, but a hint only and one fluently and pleasingly integrated with complex fruit and floral notes. In this month’s samples we tended to associate the ferment hint most often with brandy, though rye whisky popped up again out of our bank of associations, as did a suggestion of dark rum (in Thanksgiving Coffee’s sweetly tropical, 94-rated Byron’s Maracaturra Natural Nicaragua). Sweet-fermented spirits-associated notes aside, the naturals reviewed this month showed variations on often exotic full-flavored low-acid fruit that ranged from delicate and layered to deep and opulent, always with floral complication and usually a crisp, nut-toned chocolate we like to call roasted cacao nib. Finishes in these dried-in-the-fruit coffees tended to be clean, deep, resonant, often with considerable flavor persistence in the long and little to no excessive drying or astringency. True, if these same coffees had been processed by the classic wet method I suspect they would have scored well too, but when processed by the natural method they appeared to show a different side: deeper in sensation, less bright but rounder and richer in the acidity, a little more syrupy in the mouthfeel, and arguably more complex in flavor. I find it much more difficult to generalize on this month’s honey coffees. They displayed a greater range of profile, perhaps because there were more variations in the detail of the processing, particularly regarding how much pulp was allowed to remain on the beans during drying. Occasionally a sample showed a slight sweet spirits note, like the outstanding 94-rated Compelling & Rich Panama Chiriqui Finca Santa Teresa Geisha, but generally the honey-processed samples displayed neither the fermenty hint nor the richly complex fruit displayed by the best naturals. Most were sweet but tended to be more crisp and brisk in acidity and fruit, and generally a bit brighter though a little less complex than the naturals. And honeys at the bottom of the ratings often showed a sweet but rather dull, woody or walnut-like character, sometimes compounded by careless light-roasting that appeared to leave the centers of the beans underdeveloped. Now to the issue of tree variety. Most of this month’s high-rated coffees were not only recipients of obsessive attention during drying and fruit removal, but also were produced from trees of botanical varieties of Arabica that are, if not celebrated, are at least admired. We had three samples from that poster bean of varietal distinction, the pricy, rare Gesha/Geisha variety. Two of the high-rated Geshas were naturals, including the spectacular 97-rated Klatch Panama Ironman Camilina Geisha and the 94-rated Namusairo Panama NPGE Perci N2. A third, the 94-rated Compelling & Rich Panama Chiriqui Finca Santa Teresa Geisha, was nicely honey-processed. In addition to famous Geshas, we also reviewed two all-heirloom-Bourbon samples in the 93 to 94 range as well as one all-Maracaturra sample. Maracaturra is an unusual cross between the sturdy, widely-planted Caturra variety and the oddball, mammoth-beaned Maragogipe. The cross was created by the farmer who produced the coffee, Byron Corrales, and is conceptually related to the better-known Pacamara variety, a cross between the Pacas and Maragogipe varieties that was first pioneered in El Salvador. Finally, one can gather from this cupping how attentive many producers are now to the potential of trees already established on their farms. The Bacca Café Panama La Berlina Typica Natural (94) claims to be from trees of a very old strain of the classic Typica, the variety first planted in Latin America. The Spyhouse Finca Angelina Cost Rica Honey (93) was produced from trees of the local Villa Sarchi variety. Villa Sarchi, like Pacas and Caturra, is a mutant of the heirloom Bourbon variety, but in this case one that apparently was first selected in the West Valley growing region that produced this month’s Finca Angelina sample. A note on Geshas/Geishas: Of the five coffees labeled “Geisha” or “Gesha” we cupped for this month’s article, three (all reviewed here) were splendid, but two, alas, showed very little Gesha character in the cup. Furthermore, the bean shape for one did not look much like a Gesha. One of these maybe Geshas was from Guatemala and the other from Costa Rica. Both were solid enough coffees (rated 89 and 91 respectively) but a consumer buying either would not be experiencing the intensity and intricacy we have come to expect from a bona fide Gesha. Finally, I’d like to add a tribute to our readers and other specialty consumers. The originality and success of the coffees in this month’s article is in part a tribute to those of you who are reading this article and are willing to pay premium prices for the finest and most original coffees, whether a blow-out 97-rated Geisha at fifty dollars a half-pound or a moderately priced fine natural or honey produced from a less rare variety. 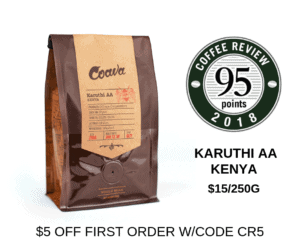 Ultimately you reward both roasters and producers with the margins they need to continue to advance coffee as a creative, constructive human endeavor rather than a dreary morning habit often subsidized on the backs of the tropical poor. This support for quality and distinction is particularly important now, when Central American farmers face the additional daunting challenges of climate change and the coffee rust epidemic.